UFO SIGHTINGS DAILY: Sculpture of the Egyptian God Horus on Mars, May 2016, Video, UFO Sighting News. Sculpture of the Egyptian God Horus on Mars, May 2016, Video, UFO Sighting News. 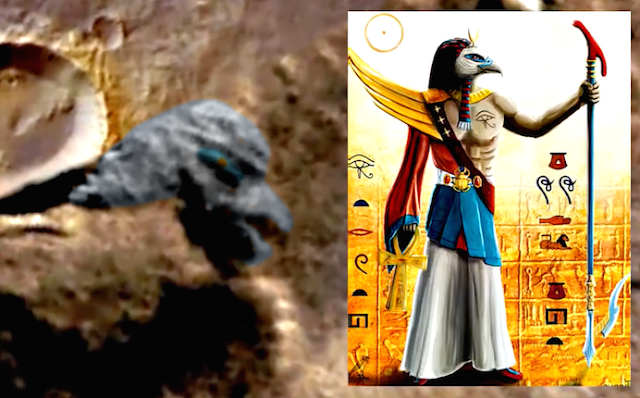 This giant head of the Egyptian god Horus was found on Google Mars map (free program) by Youtube user Luxor2012UFO. You can easily make out the large open beak, eye, feathered head of Horus. The resemblance is uncanny. I am a bit stunned by the detail of it. This is further proof that the gods of Egypt that came from the sky and helped build Egypt...were actually aliens.